Update: By the second day of their trip to Haiti, Oklahoma Disaster Relief had seen 300 patients and had dug through 16 feet of stony soil on the well they were drilling. They continue to work with the victims of the earthquake and appreciate your prayers. 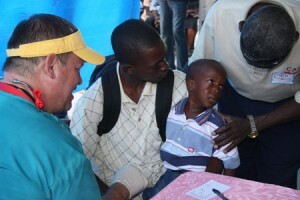 Bobby Lipscomb visits with a father and his young son during triage at the medical clinic at Carrefour. Haitian church members congregate to wait to see the Oklahoma medical team at a clinic at Carrefour. PORT-AU-PRINCE, Haiti–The Oklahoma disaster relief medical team treated 135 patients at the clinic it established at Carrefour just west of here Feb. 8. The team was welcomed by Libien, pastor of the Baptist Spirit Church of Carrefour, which is located near the epicenter of the Jan. 12 earthquake that struck the island nation. Meanwhile, after purchasing the final materials it needed, the group’s water drilling experts located a site and set the stage to begin drilling a well at the Baptist church in the Brache area, further west. Pastor Francois Milot expressed heartfelt thanks to the Oklahomans, who were joined by a teams from Georgia and Alabama, for their pending work in drilling the well and providing fresh water to the area. Many of the patients who visited the medical clinic the first day were women and children, including several infants. Haiti has the highest infant mortality rate of all the nations in the Western Hemisphere.The group also included several elderly people. 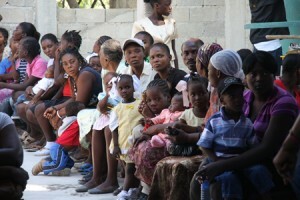 The church is located in one of the areas with the highest density of population in the Port-au-Prince area. As the teams traveled to their destinations, visible evidence of the damage was still apparent for miles. Haitian officials have estimated that more than 1 million people are sleeping outdoors under tents and other temporary shelters because they are afraid to sleep in their homes. What can this commercial teach about ministry? Many things perhaps. Kevin DeYoung points out one thing here.